Home ownership begins with a tent in Animal Crossing: Jump Out. Animal Crossing was one of the first games announced for the 3DS in 2010, and a 2011 E3 trailer provided a glimpse of the exploring, gathering, socializing, and home decorating that somehow make the series so addictive. Since then, Nintendo has been tight-lipped about Animal Crossing, neglecting to provide a release date or even gameplay information at any of their E3 press conferences this year. Thanks to Japanese magazine Famitsu, some new details about the game have been revealed, including its official title: Animal Crossing: Jump Out. 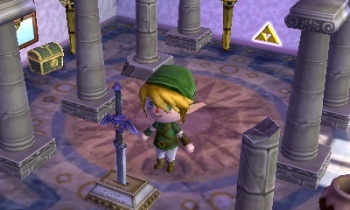 Jump Out will have familiar features for longtime Animal Crossing fans, such as the Able Sisters' clothing shop and the museum. The game will also have a gardening shop for the first time, allowing players to purchase flower and tree seeds. Tom Nook is still managing the town's real estate market, of course, but now players start in a tent, and there appears to be a much deeper level of home customization. There's still no release date, but perhaps the reveal of these new details means that Nintendo is closer to telling us when to expect the game. Of course, if you're really missing Animal Crossing, you could always pop in one of the previous iterations and see how your abandoned town is doing.